News 5 – The City of Humanity Website now has a Gallery - A gallery section has been added to this website. In it you will find photos of the premier, rehearsals and behind the scenes work for the premier of City of Humanity 1. The premier of City of Humanity 1 Reviewed in Ritmo the most prominent Spanish Classical music magazine. 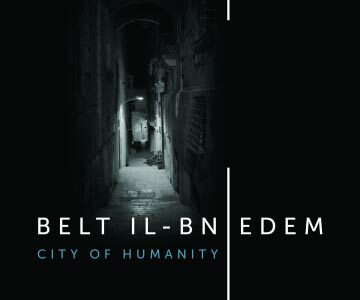 Belt il-Bniedem (City of Humanity) is an artistic/educational project conceived by the composer Reuben Pace and being done in collaboration with the Ministry of Education and Employment and the Ministry of Justice, Culture and Local Councils. It focuses on the creation of a brand new operatic production which will be premiered in 2018 when Malta's capital city Valletta will be the European Capital of Culture. Whilst the music is being composed by Dr.Reuben Pace most of the rest of the production is being done by students from different educational entities from secondary schools up to University (visit the participants page to see who's taking part). The first opera shall be premiered on the 14th of November 2018 in the Republic Hall at the Mediterranean Conference Center. Tickets start from €30. A chance to bring the academic world nearer to the job world. Work side-by-side with real world professionals. A chance to explore and expand themselves and their talents. Appreciate better the value of team work and coordination. Realise the difference between theoretical planning and the practical world. The work which they are doing as part of their curriculum will be used in a real world production. Learn new skills and knowledge outside the classroom environment. All this will eventually lead them to make a better career choice. This project gave the opportunity to the students of photography at the University of Malta to express themselves and interpret the project in their own terms using photography. The students gave their contribution and showed keen interest because their work is being used in a contemporary production. I am honoured to have written the first libretto of this opera cycle about the Great Siege of Malta (1565) and hence about the birth of a new city. In the second opera about the second World War, I am delighted to help young writers from Government Schools in the scripting of this story, based mainly in Valletta during the years preceding the war and during the war, hence its effects on the history and culture of Malta. The enthusiasm of the young budding writers has been an inspiration to me and made me feel a proud mentor. Through a number of lectures of staging skills and practices together with a number of students and a talented architect, we have concluded the designs necessary for City of Humanity1 – SWAR (Fortifications), the first opera in an opera cycle being held next year in Valletta - European Capital of Culture 2018. Through media and communications, there are specific areas which overlap in Architecture, therefore being part of the team definitely helped define this project. Art and Music permeate every aspect of our lives and have an uncanny ability to unite all individuals and peoples. City of Humanity (Belt il-Bniedem) is an important project which will connect the power of art and music to our lives and make Malta even richer and more wonderful. This project will embrace diversity and opens the door to look into our cultural experience of the past present and future. This project is teaching me a lot about writing for an international production with people of diverse opinions, and it is giving me a fascinating outlook on our past. It is an honour to be a part of this experience. Giving them a platform to develop regardless of their artistic area. Create new multi-disciplinary productions of high calibre which utilise Malta’s immense historical and cultural heritage in a unique way. Making possible creative tasks which could not be done by isolated entities thus making optimum use of the artistic creative assets of our country. Collaborations and networking with foreign cultural and educational entities are being also established to the mutual benefit of all.